For some though, the most pressing questions raised by the widely viewed broadcast centered on the various instruments that could be spotted in different performances throughout the night. In fact, when looking at real-time traffic data on Reverb, we can see various blips and swells in the volume of searches for particular makes, models, and types: During the Red Hot Chili Peppers slot last night, views on Flea Signature Bass listings went up 33% over a typical Sunday. Last night also brought a noticeable uptick in searches for Gibson LG-1 acoustics, the model that Brandi Carlile—who won three awards last night—played during her fantastic performance of "The Joke." 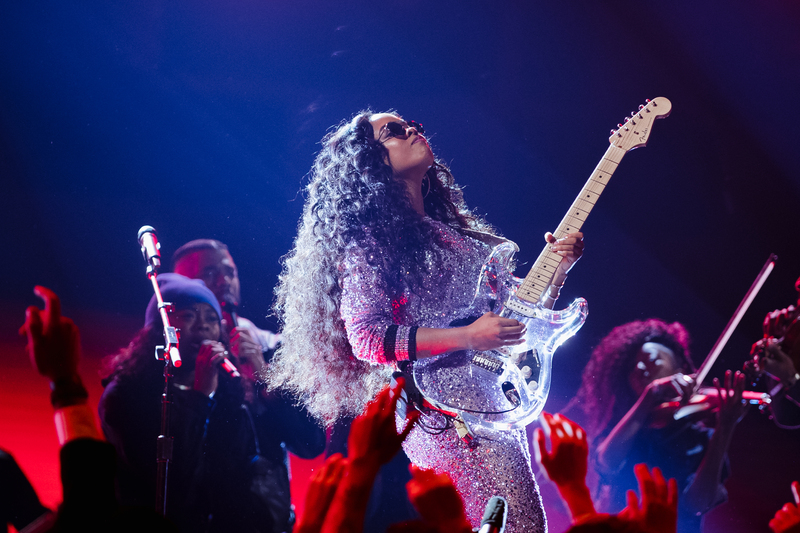 But perhaps the most eye-catching guitar of the evening came in the form of a clear Stratocaster that Best R&B Performance and Album winner H.E.R. shredded during her performance of "Hard Place." Not only did searches on Reverb for "clear Stratocaster" spike up during the song but so too did the search volume on Google showing that a lot of people were curious about the funky Fender. Clear guitar bodies—usually made out of some form of acrylic resin like Lucite—have been around since at least the 1950s, when Fender, according to vintage guitar lore, produced a totally see-through Stratocaster as a promotional item. Fender made at least a few clear-bodied prototypes in the '60s (including a a custom model for Beach Boy Carl Wilson) though no such models ever made it into full production. For a few years starting in 1968, the Ampeg company marketed a set of clear guitars and basses under the Dan Armstrong brand name. The Rolling Stones used them for a time, and they remain the most famous clear-bodied instruments on the vintage market. Since then, plenty of other companies have made see-through instruments, though Fender has never made a regular production clear Stratocaster like the one played by H.E.R last night. Her guitar did clearly say Fender on the headstock which means while it could be a non-Fender body made by a brand like George Fedden with a Fender neck, it's more likely a rare acrylic Fender Custom Shop model. This seems especially likely given that H.E.R. has worked with Fender before, and there was a post on the Fender Custom Shop Instagram showing off a clear Strat built by Scott Buehl just last week. Update: We reached out to Fender and have confirmed that it was indeed the Custom Shop guitar featured on their Instagram. Catch H.E.R. 's solo at around the 4:00 min mark. Regardless of the exact make and model of this guitar, it was clearly an excellent bit of visibility of Fender in a night full of them. Earlier in the evening, Janelle Monáe kicked off her epic performance with a sweet Duo Sonic in hand. Post Malone, in the aforementioned collab with RHCP, donned a Custom Telecaster complete with white binding, as did Shawn Mendes in his duet with Miley Cyrus.